While Facebook isn't jumping into the 360-degree camera business, the social media giant is joining the hundreds of camera makers by offering up its own device. 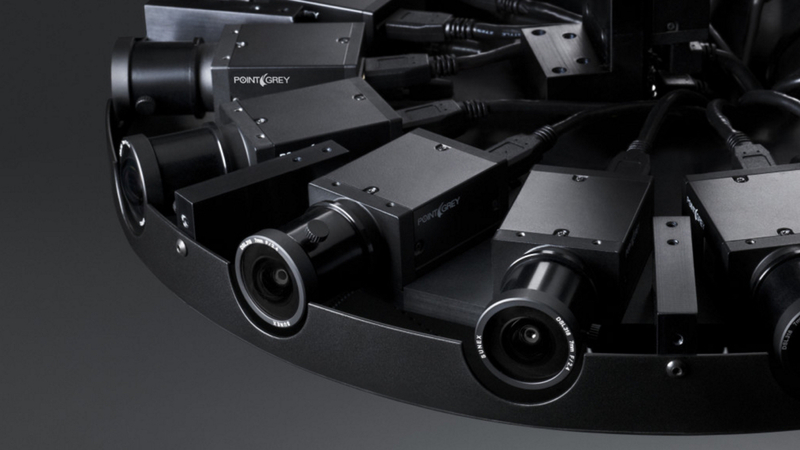 Called Surround360, the rig has 17 cameras with one fish-eye camera pointing up and two others pointing down to capture footage that will render online via a specially created software. From there, images will be stitched together in 4K, 6K and 8K for each individual eye. According to Facebook, the stitching code should reduce post-production time thanks to a series of algorithms. Stitching time should only be an overnight endeavor opposed to weeks of editing. All the hardware and software designs will be made free for public use later this summer. Last year, Facebook boss Mark Zuckerberg said that AR and VR will be among the most shared forms of content in five years. Now after shipping Samsung Gear VR and Oculus Rift, Zuckerberg further cemented the company's interest in the technology by discussing how AR and VR will figure into Facebook's 10 year roadmap. Nothing entirely specific was mentioned but he did say AR is "going to take a long time to work." From there, he mentioned how of AR and VR devices will continue to shrink, and eventually merge into one gadget. "Over the next 10 years, the form factor's just going to keep on getting smaller and smaller, and eventually we're going to have what looks like normal-looking glasses that can do both virtual and augmented reality. And augmented reality gives you the ability to see the world but also to be able to overlay digital objects on top of that." "As a matter of fact, when we get to this world, a lot of things that we think about as physical objects today, like a TV for displaying an image, will actually just be $1 apps in an AR app store. So it's going to take a long time to make this work. But this is the vision, and this is what we're trying to get to over the next 10 years." While we've seen plenty of VR from the company, it should be interesting to see what the Menlo Park team cooks up in terms of AR. Perhaps official news of a HoloLens rival is something we can look forward to at next year's conference.